Hi, I am interested in your 1932 Ford Other Ford Models (stock #1692-TPA) listed on Autotrader for $31,995. I'd like to get more information about this vehicle and confirm its availability. 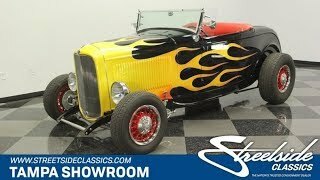 This 1932 Ford Roadster is a quality build with all the right extras. So read on for all the details, because its more than just the custom flame paint that makes this V8 roadster red hot. The 32 Ford is an iconic shape, but it takes hard work to get it right. This starts with a quality fiberglass body with a steel hood. That way you get tight tolerances on the body panels and doors, and a hardy construction when showing off the butterfly engine cover. Of course, practicality is not what first attracted you to this one. Its the flair that you love. The glossy black background is the perfect canvas to paint the artistic flames. It starts with a pearlescent yellow at the grille, and it burns into red-hot tips accented by blue pinstriping. Its such a complete custom creation, that it looks like the fire wants to consume this whole street machine. And because this is all cleared over, it really knows how to follow the sleek lines of the car whenever the sunlight hits this 32 Ford. Theres a nice black folding roof that coordinates with the exterior, but we all really know a machine like this is meant to be open to the world. Thats why they spent plenty of time on the details here. We love how the bold red matches the wire wheels on the outside for a great uniform presentation. The full upholstery package has a nice tuck and roll design that wraps around the car, and theres even some nice black piping to match the carpeting. There are some convenient features like the tilt steering column, side wind deflectors, and cup holders, but what youll really love are the authentic hot rod details. These are pieces like the banjo-style steering wheel with Ford V8 center cap and the bright dash panel full of Stewart Warner gauges. Theres a great presentation under the hood. Youll love details like the yellow plug wires that remind you of the exterior flames; the red ribs of the valve covers matching the red block; and the overall tidy presentation. More than just look great, this is a 350 cubic-inch crate V8 that has been upgraded with a large Demon four-barrel carburetor, hi-rise intake, upgraded pulleys, an electric fan, and shorty headers that feed sweet-sounding Borla dual exhaust. So you really get the power and sound this hot rod deserves. Plus, as you look at the undercarriage photos, youll spot some nice upgrade like the polished hairpins up front, and in the rear, theres a bright four-link with adjustable coilovers. Plus, you have great anytime driving features like the front disc brakes and a four-speed automatic transmission w/overdrive. This is the iconic 32 roadster done right. So if youre looking for the complete and detail-oriented package, dont miss this deal. Call today!! !